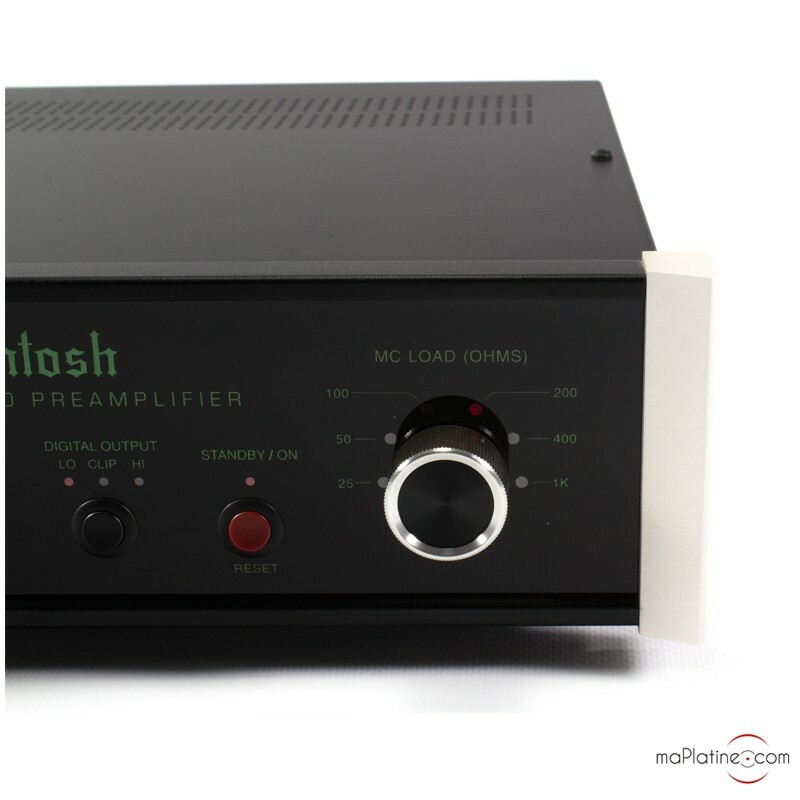 In the wake of the vinyl revival, manufacturers like McIntosh have had to rise to the challenge of producing a phono preamplifier worthy of the brand’s name. And that’s exactly what they've done with their MP100 phono stage! 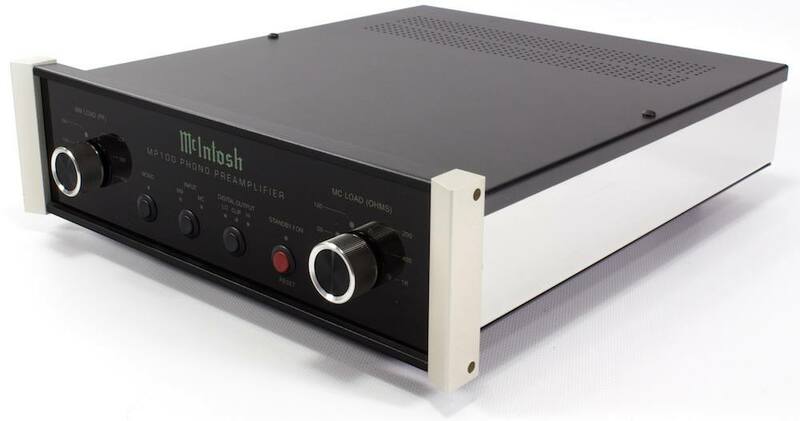 In our opinion, it is the best standalone phono stage ever to come out of the US brand’s workshop in Binghamton, NY. 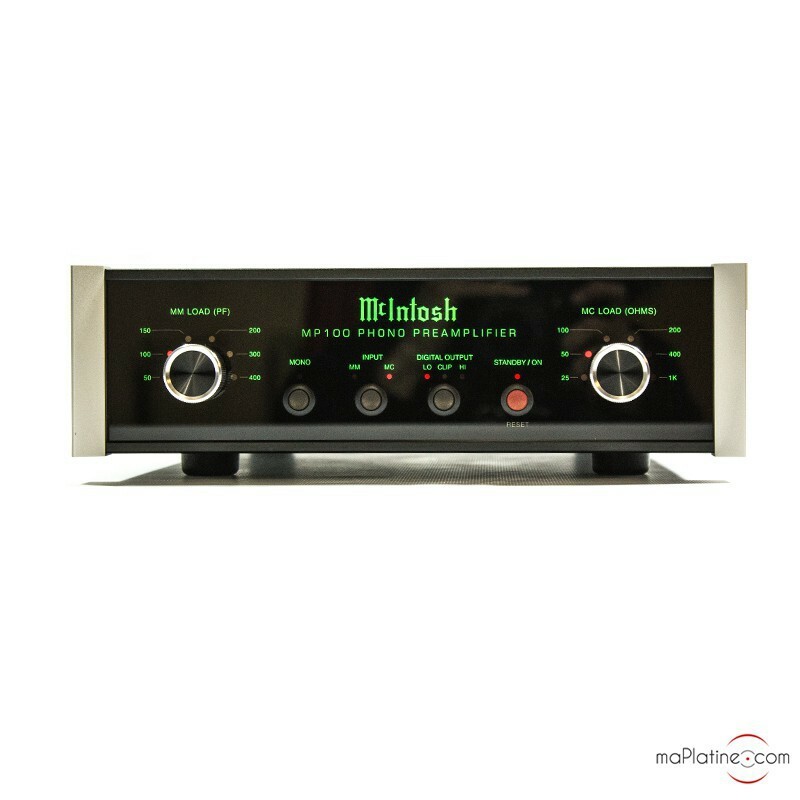 Like all McIntosh products, it takes the form of a gorgeous black steel housing with a striking polished glass front panel. It may be compact in size, but the MP100 still retains the American brand’s strong identity, with the signature backlit green logo and rotating chrome selector – you either love it or hate it! 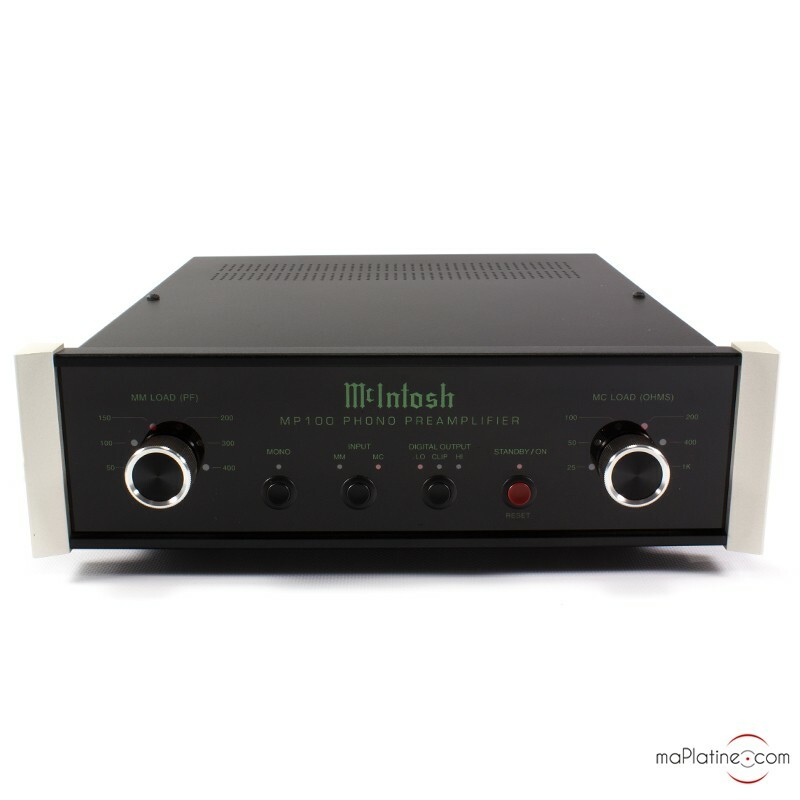 We think it’s both absolutely timeless and a marker of 50 years in the world of high fidelity – we love it! So, on the front panel you'll find one selector for capacitative loads (MM) and another for resistive loads (MC). Each selector has 6 settings to choose from. Between the selectors are 4 buttons for selecting mono or stereo, the MM or MC input, and the digital output level for the DAC. We also like that it gives us the option to transfer signal in mono for monophonic recordings, which, as well as reproducing the signal more accurately, also reduces surface noise. 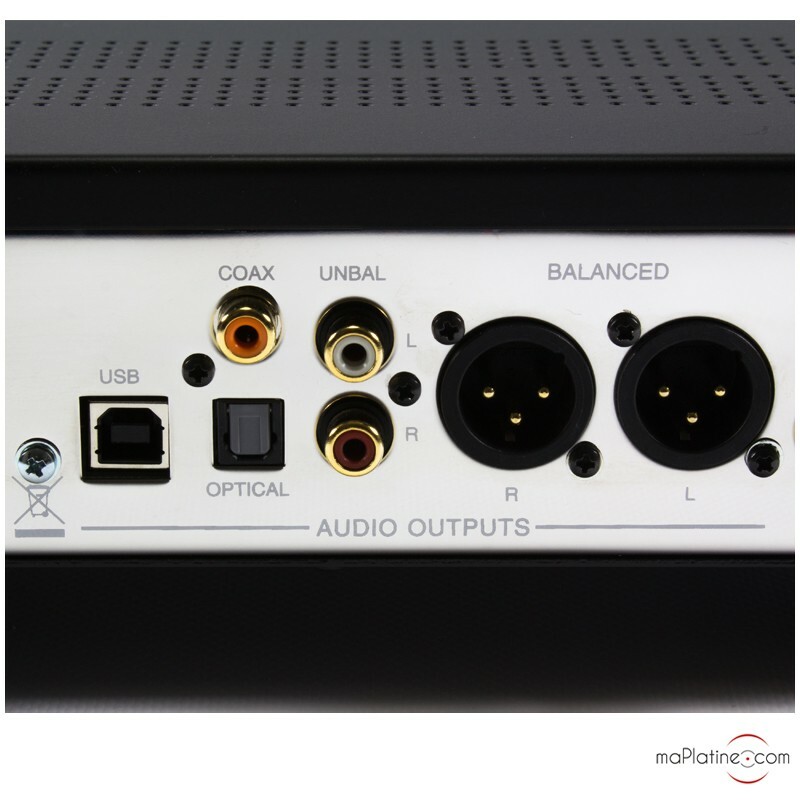 On the back are 2 separate phono inputs: one for moving magnet cartridges and one for moving coil Hi-Fi cartridges. 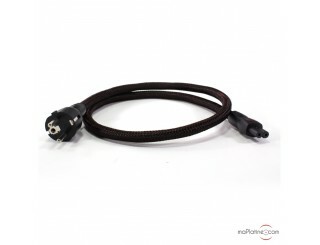 Also on the back are a symmetrical (XLR) output and an asymmetrical (RCA) output. And in the digital corner are Toslink optical, coaxial and USB outputs. 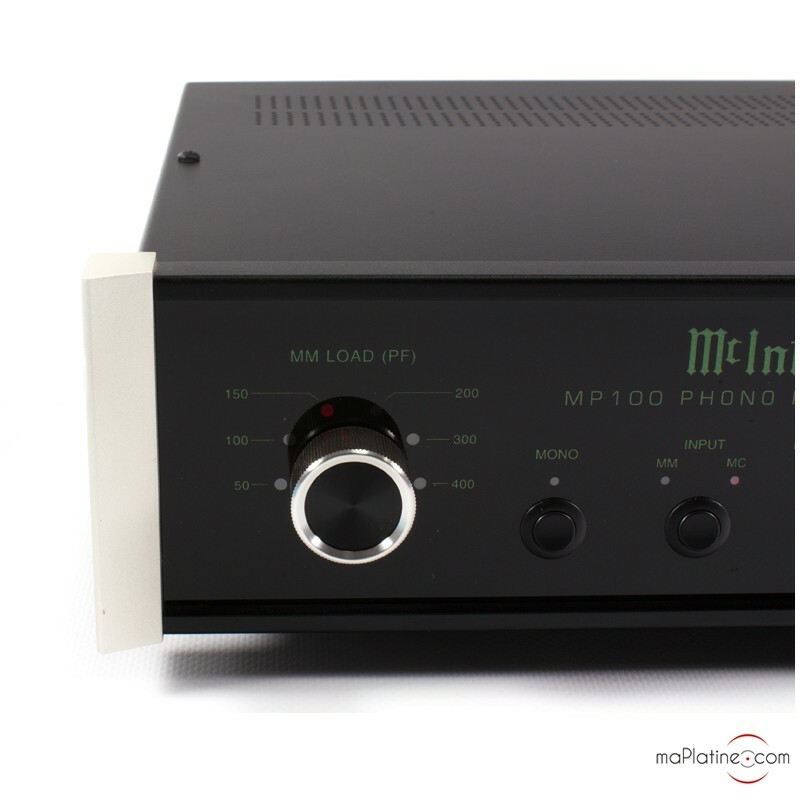 When used with high quality recording software, the McIntosh MP100 phono preamp can record digital files to a high quality via USB. 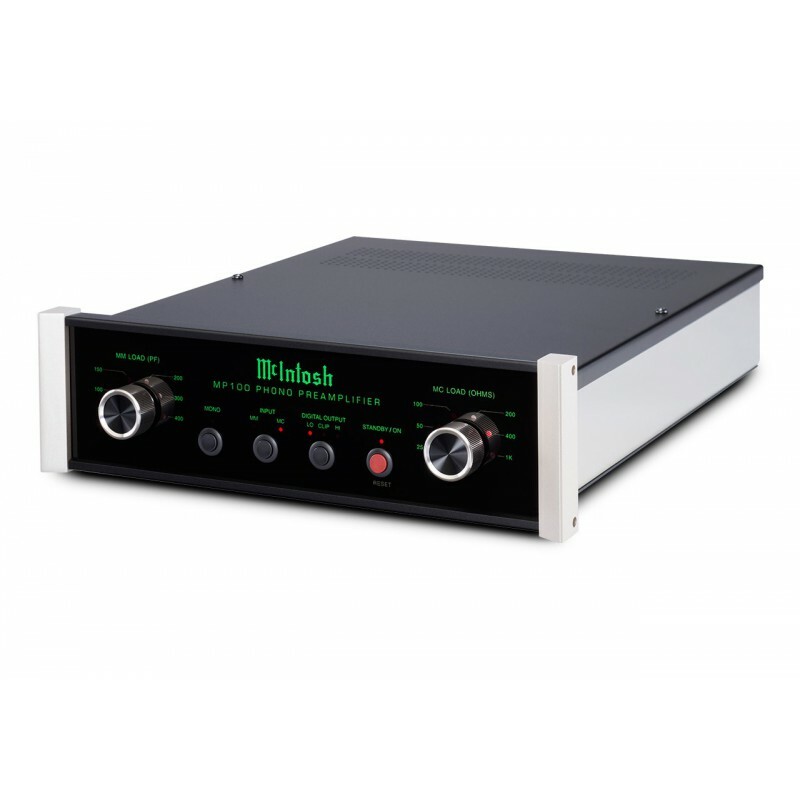 The digital outputs deliver a signal of 24 bits/96 kHz. The high/low output selector lets you adjust the digital output level to prevent distortion. 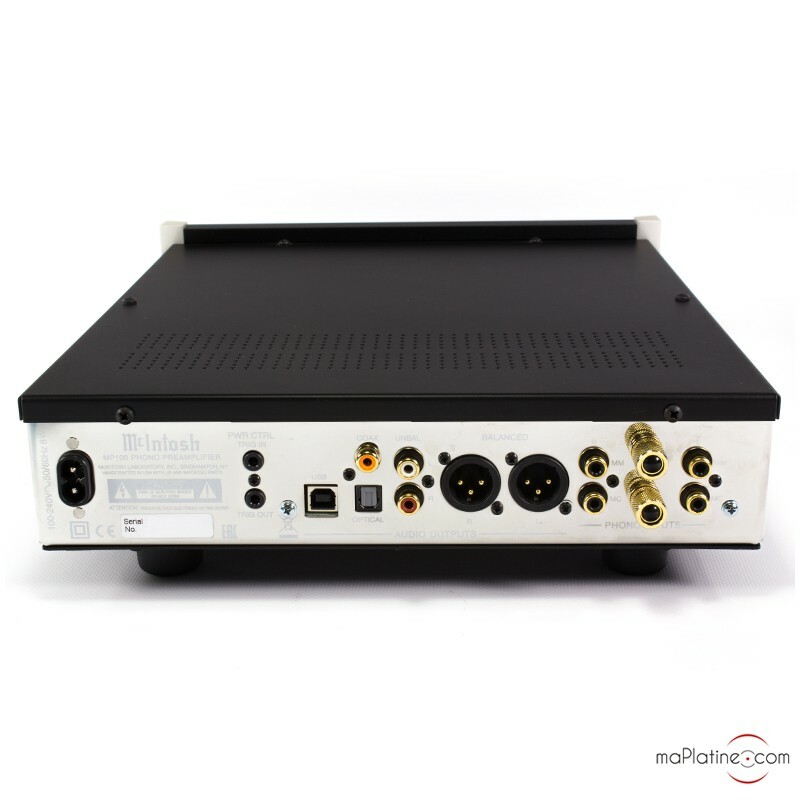 This phono preamplifier is one of the few models, if not the only one, that are compatible with products with digital inputs only, such as the Devialet Phantom. The sound it produces is of signature McIntosh quality. 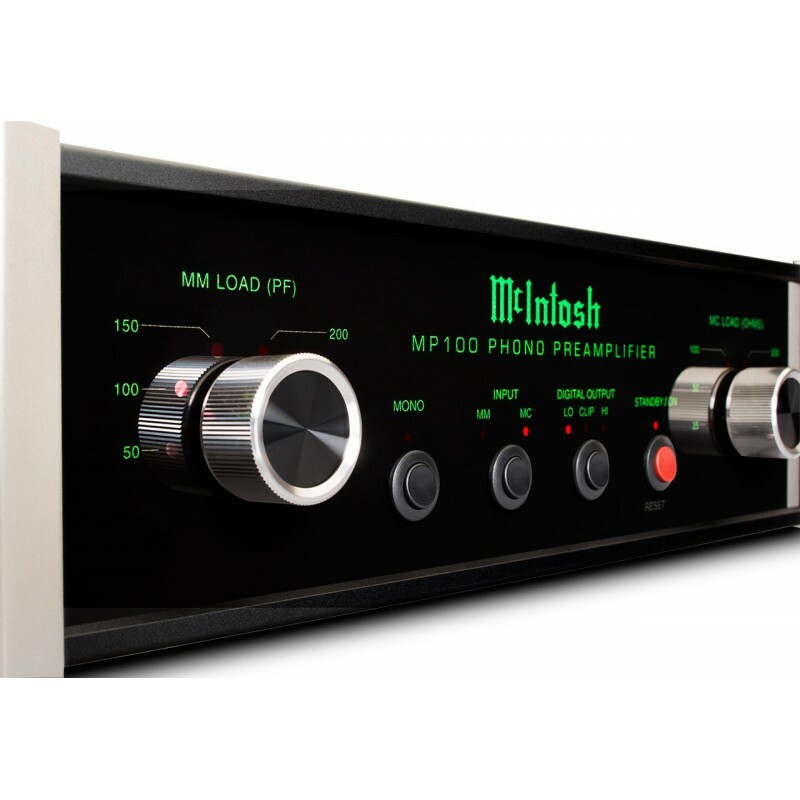 The McIntosh MP100 is just as impressive as any of the brand’s integrated preamplifiers and amplifiers, and even outperforms them in some respects. For example, it boasts more neutrality and an impressive dynamic range. In fact, it has all of the brand’s signature musical qualities: the impressive dynamic range, presence and timbre, to name a few. It’s a triumph, especially for a first go! 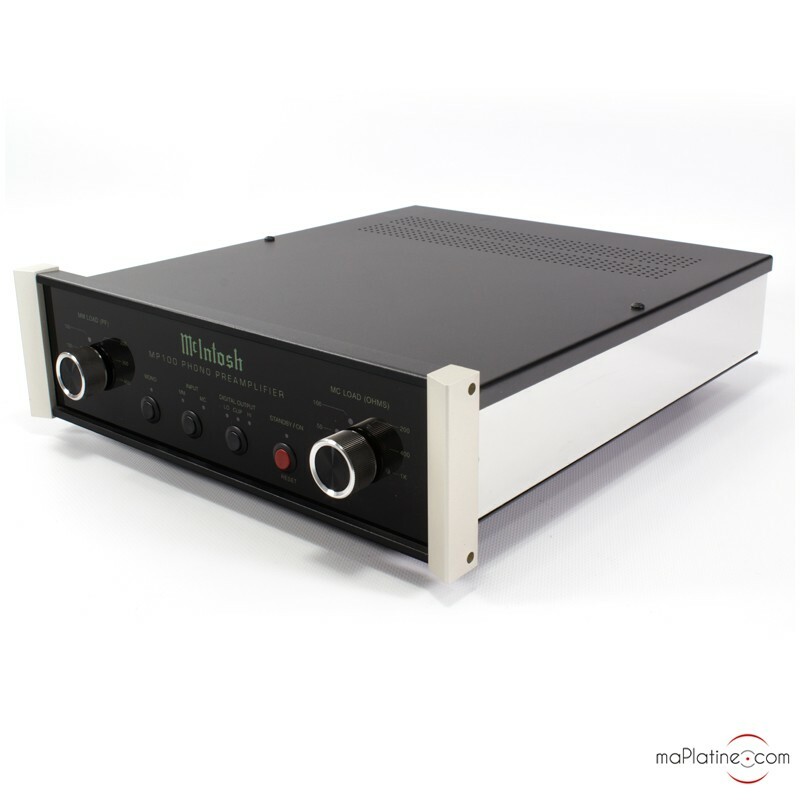 The bite of the McIntosh MP100 phono preamplifier is definitely as good as its bark! Playback is bursting with life and does absolute justice to the analogue sound.